100V-USB charger for a general-purpose cellular phone was produced with DIY putting up the USB socket to the charger for the cellular phone of the useless article not used. Because the USB extension cord sold in the hundred-yen store had been used, it was possible to make it from 105 yen. When the battery disappears, it is a box of [**] though the cellular phone is convenient. When it is possible to charge it also in the car, the office, and the second house, it is convenient because it is not always in the house. When the cellular phone is newly bought, an old charger for 100V remains. However, when the terminal form is different, it is not possible to use it with a new cellular phone. The charger of an old cellular phone for this 100V was used and it was general-purpose The USB charger was made from DIY. If the output of the charger is united to USB, it is possible to use it by the general purpose. I am uniting the charger that uses it with the car to USB. Because as for the voltage of the charger of the cellular phone, there seem to be a lot of one of 500-700mA every 5.4V. I think that I can use it also for the thing of the manufacturer where maybe. Please produce it with the self-responsibility when my making it. 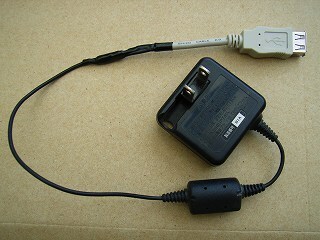 Please use the AC adaptor of the switching method of about 5V1A if you make it to a general-purpose USB power supply. A lot of things with a large voltage change cannot be used for a usual AC adaptor that is not the switching method as USB power supply. The number of the terminal USB and the usage of the terminal were shown in this photograph. The plug side is this quite the same array though this is standard A a socket. Because the voltage of 5V is 4.75-5.25V in the USB standard, it is not possible to use it as USB power supply with the charger of the cellular phone of 5.4V. It is only to the last for the charge with the cellular phone. It is likely not to break if it is such a voltage difference even if it uses it for other universal serial bus devices by mistake. 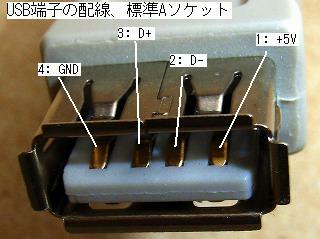 The power strip of the terminal USB is identified. It is necessary to identify the line in the power supply of the USB extension cord bought for 105 yen in the hundred-yen store. As for the color of the code, red, white, green, and the black were used. The USB plug side is connected with the terminal USB of the personal computer, the tester is connected with the place where the coating of the code was peeled off, and the voltage is measured. The line in the power supply can be specified even if it doesn't know the standard of the terminal USB if it does so. 1:+5V red and 2 in case of me: white and D -3: green and D + 4: It became ..GND (-).. black. This is a completion photograph of 100V-USB charger for the cellular phone. The code only on the USB socket side of the code of the charger for the cellular phone of the useless article and the USB extension cord is only connected with solder. The wick line that is the same ax is a plus 5V in the code of the charger for the cellular phone, and the net line side is minus sides. The polarity is matched and connected. 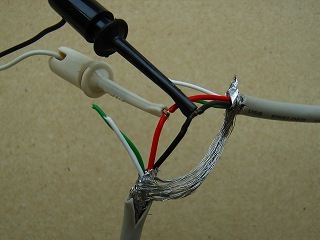 The braided wire of white, green, and the shield is not connected anywhere. The [horumaru] line was used for the code of the charger for the cellular phone, there was no connection even if the coating was taken, and getting on of solder seemed to be bad as it was. The coating of polyethylene and the polyurethane was burnt raising the temperature of [kote], and heating it enough and it soldered. The connection point finishes very beautifully if it processes it with the heat-shrinkable tubing insulating it with the vinyl tape. The colors of the code can be united though it was better. It charges it with 100V-USB charger for the cellular phone. When 100V-USB charger for the cellular phone is completed, the USB charge code for the cellular phone is connected with the USB socket side, it connects with the cellular phone ahead of that, and it charges it. It is used because the USB charge code is sold to the hundred-yen store for 105 yen when this is not. When not the USB charge code but the USB communication code was used, it was possible to charge it by the USB communication code of the attachment in 821SC of SoftBank (made of SAMSUNG). However, it was not possible to charge it though the USB communication code was obtained in the hundred-yen store and it used it for 831P of SoftBank (made of Panasonic). Moreover, even if the cellular phone is connected with the personal computer by using this USB communication code, it is not possible to charge it. However, it was possible to charge it by installing the USB driver in the personal computer. How do it become it?